Denny Hamlin and the #11 FedEx Office Toyota finished fourth in Sunday’s Coca-Cola 600 at Charlotte Motor Speedway behind race winner Kevin Harvick, Kasey Kahne and Kurt Busch. 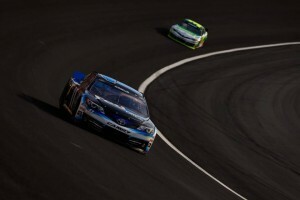 Starting from the pole after setting a new track record of 195.624 mph on Thursday, Hamlin led the first seven laps before being overtaken by Joe Gibbs Racing teammate Matt Kenseth as his car began to tighten up in the afternoon sun. As day turned to night, his #11 Toyota Camry began to get loose and from then on it was up to Darian Grubb and his FedEx Office pit crew to keep making the right adjustments. There were 11 caution periods and the race was red-flagged twice, once for a multi-car accident, the other, after a cable from an overhead camera broke and fell on the track surface, damaging Joe Gibbs Racing teammate Kyle Busch’s car and causing minor damage to the #11 FedEx Toyota’s right roof rail and right roof flap. Hamlin ran in the top five most of the race but had fallen to ninth after his last green flag stop with 37 laps to go. On lap 384 of 400 the final caution came out for debris and Hamlin pitted from seventh to take two tires, picking up three spots on pit road. Hamlin’s fourth-place finish moved him up three spots to 24th in the NASCAR Sprint Cup standings. Sprint Cup action resumes June 2 at the “Monster Mile” when Dover International Speedway hosts the FedEx 400 benefiting Autism Speaks.